The Bell Tower on Historic Main Street is a unique sight. Not many towns can boast of such a structure in the middle of their town. It has its own history, and in its day served a most vital and important role. It was first called the Plaza. The Tower was dismantled and moved to Cannon Hill in 1911. Cannon Hill received its name because in the early days, there was on top of the hill a National Guard Armory that had a mounted cannon in front of the building and thus the name Cannon Hill was given to the area. Electrical difficulties in ringing the bell from Cannon Hill resulted in the bell being moved back to the plaza in 1912. It stood there through the years until a car struck the Plaza in 1965, almost toppling over the bell. It had become somewhat shabby over the years and some were in favor of its removal. But the old timers, remembering why it was there, insisted it should be saved. 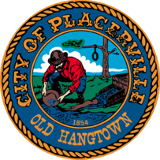 Finally, in 1969, the City Council and the Placerville Fire Department voted to renovate the structure and the project was completed in 1970 with an electric siren installed to replace the new silent bell for the second time. The first electric siren was installed by the late Joseph Leonardi assisted by several linemen of the old Western States Gas and Electric Co.(later purchased by P. G. & E.) This occurred sometime between 1920 and 1921 shortly before the Ohio House burned. Along with the 1970 installation, three other sirens were installed; one near El Dorado High School and Bennett Park; one in Upper Town(now Broadway) near the Lutheran Church; and one on the Sacramento Street Fire House (Station No. 1).